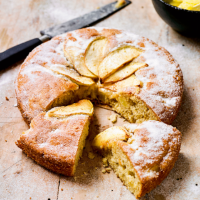 This moist Dorset apple cake, based on a traditional recipe, has a wonderful topping of sliced apples dredged with sugar. Great for a teatime treat. 1. Preheat the oven to 190°C, gas mark 5, and lightly grease a 20cm springform cake tin. Peel the apple, cut into quarters and remove the core. Reserve one of the quarters and dice the rest. 2. Sift the flour, baking powder and mixed spice into a large bowl. Rub in the diced butter to form fine breadcrumbs. 3. Stir in the diced apple, sugar and lemon zest, then gradually stir in the beaten eggs to form a stiff mixture. Spoon into the prepared tin and level the surface with the back of a spoon. Thinly slice the reserved apple quarter and arrange on top of the cake. 4. Bake for 30-40 minutes, until springy to the touch. Dredge with the remaining sugar, then leave to cool in the tin for 10 minutes. Turn out on to a wire rack to cool completely, then slice and serve with clotted cream.